Roberts said Thursday he will vote against Sotomayor. 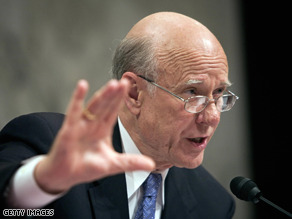 WASHINGTON (CNN) - Sen. Pat Roberts, R-Kansas, said Thursday he does not plan to vote to confirm Supreme Court nominee Sonia Sotomayor, becoming the first Republican to explicitly state his opposition to President Obama's pick for the high court. "With all due respect to the nominee and nothing personal, I do not plan to vote for her," Roberts told talk radio host Christ Stigall on Kansas station KCMO. Roberts also noted he was one of the 28 Senate Republicans in 1998 who voted against confirming Sotomayor to the Second Circuit Court of Appeals. Sotomayor was ultimately confirmed to that court by a 68-28 vote. "I did not feel she was appropriate on the appeals court," Roberts said of his 1998 vote. "Since that time, she has made statements on the role of the appeals court I think is improper and incorrect." "I think that we should be judging people not on race and gender, or background or ethnicity or a very compelling story," Roberts continued. "There are a lot of people who have that." Can't these yahoos at least do their job and wait to make up their minds after they have held the hearings and heard what the nominee has to say for herself? Jeeze what a bunch of partisan hacks. GOOD MAN!! I only wish all other republicans in the senate had as much courage and love of country to oppose this racist woman.